I’ve made it a point in all my years of blogging to be very cautious in proclaiming anything to be “the best.” Not only is that completely subjective, but I also don’t want to eliminate the possibility that something else wonderfully delicious might dethrone that Best Thing Ever. I can only think of two recipes that I’ve deemed worthy of that moniker. There are these chocolate chip cookies that I’ve been baking for years. And, then there is an amazing banana bread that surpassed all of my banana bread dreams. But, my friends, these bars are joining the ranks of the best as the best no-bake bars I’ve ever had. 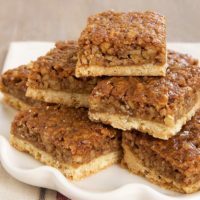 The recipe for these bars comes from Butter Baked Goods, a new cookbook from the Vancouver bakery of the same name. Bakery cookbooks are my favorite, so when the publisher offered to send me a copy, I quickly accepted. This is a beautiful book full of recipes for delicious baked goods like Chocolate Caramel Shortbread and Peanut Butter and Jelly Cupcakes. While there were several recipes that I wanted to make, these bars just called to me. First of all, there is so much chocolate and peanut butter going on here that I can’t help but love them. Besides that, there’s lots of crunch from oats and Rice Krispies. 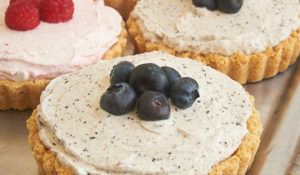 And, did I mention they are no-bake? You’ll need some stovetop time for a little melting, but otherwise you’re just stirring things together and topping them with lots of chocolate and peanut butter. Are you sold yet? I do believe this recipe is going to be a staple for me for many years to come. I love everything about them. The flavor is mind- and mouth-altering amazing, the preparation is simple, and they even keep for a long time. Plus, they’re so tall and pretty! You can make new best friends with these beauties. Or, make a batch, put them in the refrigerator, and enjoy one whenever you get a craving. By the way, vunderbar is a variation of the German term wunderbar which simply means wonderful. I couldn’t agree more. 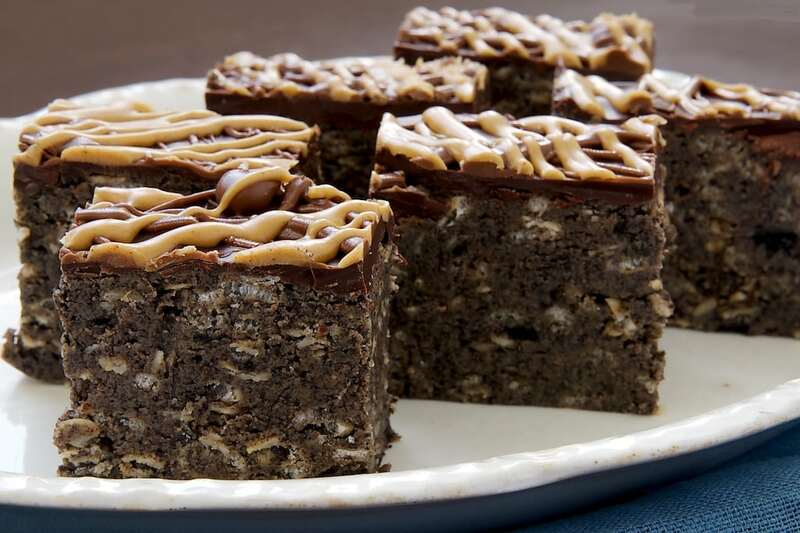 Vunderbars are an amazingly delicious treat filled with chocolate, peanut butter, and so much more. And they’re no-bake, too! Butter a 9-inch square baking pan. Line with parchment paper so that the paper overhangs about 2 inches on opposite sides. 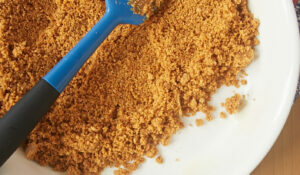 Combine the chocolate wafer crumbs, confectioners’ sugar, Rice Krispies, oats, and salt in a large bowl. Set aside. Place the peanut butter and butter in the top of a double boiler or in a heatproof bowl set over a saucepan of simmering water***. Heat the peanut butter and butter until melted and smooth. Pour the peanut butter/butter mixture over the chocolate wafer mixture. Stir until well combined. Transfer the mixture to the prepared pan. Spread evenly. Place the dark chocolate in a microwave-safe bowl. *** Heat in the microwave at half-power in 30-second increments until the chocolate melts when stirred. Pour the melted chocolate over bars. Spread evenly. Place the pan in refrigerator. Place the milk chocolate in a microwave-safe bowl. 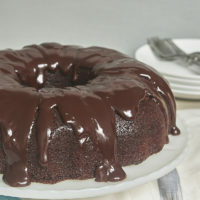 *** Heat in the microwave at half-power in 30-second increments until the chocolate melts when stirred. Place the peanut butter in another microwave-safe bowl***. Heat in the microwave at half-power for 20 to 30 seconds, or until the peanut butter is thinner and can be stirred easily. Remove the bars from the refrigerator. Use a piping bag or a small spoon to drizzle the chocolate over the bars. 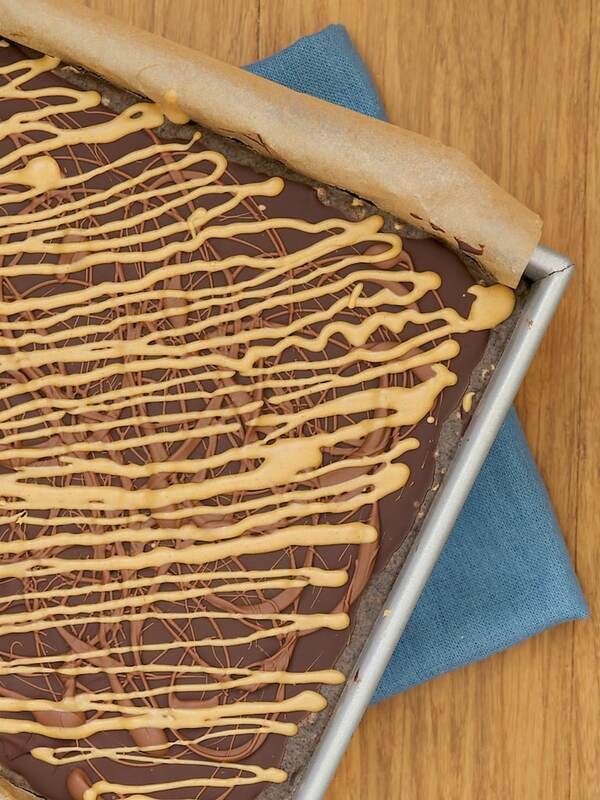 Then, drizzle the peanut butter over the bars. Place the bars in an airtight container. Store in the refrigerator for up to 2 weeks or in the freezer for up to 3 months. *I used Nabisco Chocolate Wafers. You’ll need about 2 full packages to get this many crumbs. **This is not a typo. This is A LOT of peanut butter. And, it’s so good. ***You can certainly use a double boiler to melt each of these things. I prefer the microwave method for small amounts. When melting the peanut butter and butter, though, I think the double boiler is a must. That’s just too much volume for melting in the microwave. Recipe adapted from Butter Baked Goods. One lucky Bake or Break reader will receive their own copy of Butter Baked Goods. Please note that the winner must be a U.S. resident 18 years or older. If the winner doesn’t respond to the notifying email within 48 hours, another winner will be chosen. Add bakeorbreak at gmail dot com to your address book so that a winning email from me doesn’t go to your spam folder. UPDATE: Contest has closed. Congratulations to the winner! Disclosure: I was provided with a review copy of Butter Baked Goods and the opportunity to give away a copy to one of you. All opinions are my own. This post contains affiliate links. I’ve never heard of these before, they look great though! I wonder if you could use chunky peanut butter? I love the chunky style! Hi, Rosebud. Because the peanut butter is melted, it might not work perfectly, but I think it’s worth a shot. WHOA. These totally look deserving of your coveted “best ever” title!!! What a gorgeous cookbook!! I love that title, too- thank God for butter! These no-bakes look so good!! 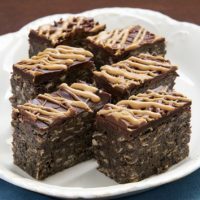 I’m usually wary of no-bakes bars but these look classy and delicious, and I can never say no to peanut butter with chocolate. 3.5 cups peanut butter!!!!! I love the idea .. but am not sure I will be able to eat these .. man these are loaded “Vunderbars”!!! I agree with your Chocolate Chip Cookies recipes. It is THE recipe now being baked at our house! I have yet to try the Banana Bread. Should have added, I guess I can reduce the peanut butter quantity right? Hi, Chandana. The peanut butter helps hold it all together. I’m not sure reducing it will work as well. I like Rosebud’s idea of using chunky peanut butter. 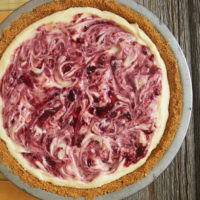 This recipe would make a great addition to a holiday care package. Wow! These do look wunderbar! I think you can confidently call these “the best”. 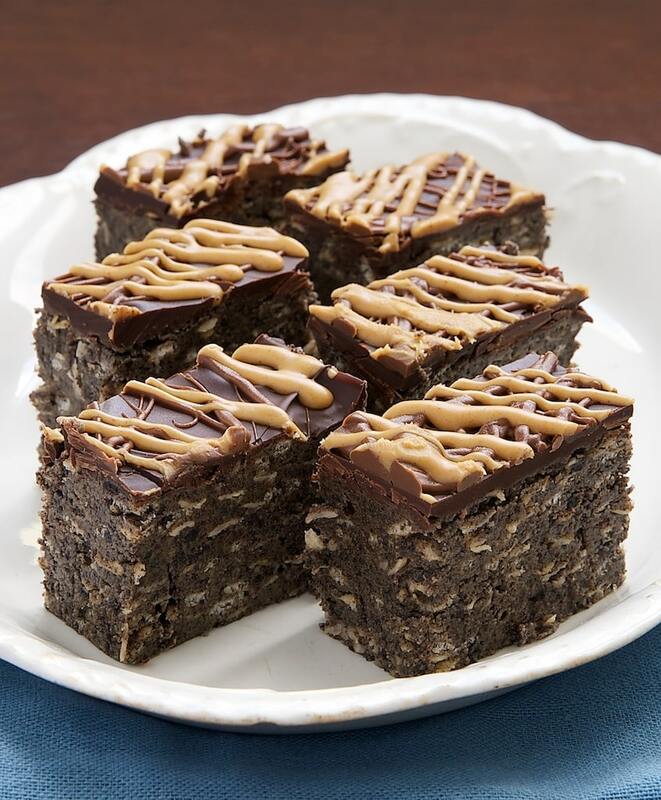 Chocolate and peanut butter all in one has to be a good thing! MOTHER OF PEARL. These look divine! That’s it. I’ve GOTTA buy that cookbook. Also, I’ve GOTTA make these squares!! Wow — these look incredible and I love how you drizzled the chocolate on top. Like a cross between a granola bar and a candy bar! Hi. First, the recipe looks wonderful! Maybe I missed the part about the 1 cup of chocolate but is that chopped or chips or what type of dark chocolate are you referring to? I normally do weights vs. measurements and a cup of chips would equate to 6 oz. of chocolate. Would that be a close approximate to what you meant by 1 cup dark chocolate? Thanks for the info AND the recipe. I can’t wait to make these!! And happily will do it with ALL that peanut butter intact! Sounds great!! Hi, Linda! 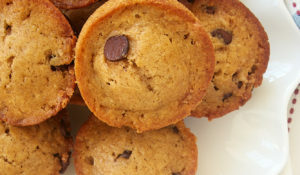 You can use chopped chocolate or chocolate chips. I used Guittard 72% bittersweet chocolate wafers. Just use whatever kind of dark chocolate you like. And, yes, 1 cup is 6 ounces. I meant to list it both ways in the recipe, so thanks for pointing that out. Enjoy! I’ve never heard of these either! But so glad I have, I love using rice krispies in new ways. Saw these bars on FG and they look incredible. I love how you wrote that this is not a typo, there is this much PB in them 🙂 TOTALLY my kind of bar! Pinned! These look amazing! 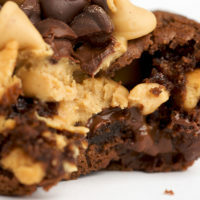 The chewiness with the chocolate and peanut butter sounds irresistible. love that they’re no-bake. I made this as part of my Christmas baking, they’re super yummy! I put mine in a 13″x9″ pan though. 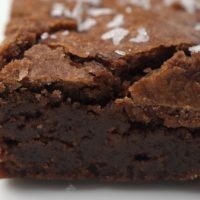 I made these bars last week and they are amazing, but I highly recommend using a larger pan. I made them in a 9-inch square as directed, and while they looked beautiful, they were way too tall to fit in the average person’s mouth! It made for some awkward eating. Next time I will probably use a 9×13 or two 9-inch square pans. Thanks for the recipe! They are very tall, Elisa. I liked them that way, but I can understand wanting them thinner. I’m glad you liked them! 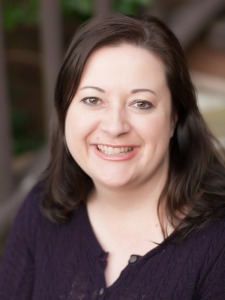 Jennifer–how long do you think these would hold up? I would love to make them today (Sunday) for an event on Wednesday, but fear that duration would compromise their freshness and impact taste. Could they be refrigerated (or even frozen) for that long and still hold up? Thanks!! Keep them refrigerated in an airtight container, and they should last for at least a few days. Sunday to Wednesday should be fine. I made these yesterday – they were delicious. However, I had a hard time when cutting them – many fell apart (some in chunks, some just crumbled). What did I do wrong? Hi, Jessica. I’m sorry you had troubles! I’ve made these several times, and they’ve always held together well. It sounds like they were heavy on dry ingredients. 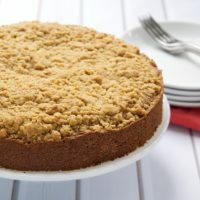 If you didn’t change anything about the recipe, then I’d guess that you either measured a bit too much dry ingredients or not enough of the ingredients that would hold it all together. Also, they do need to refrigerate the entire recommended time to help them set so they’ll cut well with a sharp knife. I had trouble finding the chocolate wafers, so I substituted chocolate graham crackers. They were delicious. The next time I made them, I used crushed Captain Crunch Peanut Butter Cereal instead if the chocolate wafers. I rolled them in golf ball sized balls and dipped them in Ghiradeli (sp?) dipping chocolate instead of cutting them into bars. They were even better. They also kept for longer since the filling was sealed inside the chocolate. Great recipe!! Those chocolate wafers can be tough to find in some places! Your alterations to the recipe sound so good! I have to try making them into balls! Hi, Kelly. I’ve never made these with natural peanut butter, so I can’t give you a definitive answer. If you tried it, please let me know how it worked. Hi, Elizabeth. I’ve never used Earth Balance, so I can’t give you a definitive answer. My guess is that is would alter the consistency, which could cause problems with the bars holding together.